Anheuser-Busch dropped a lot of cash on yesterday’s Super Bowl, with eight commercials for five of its brands totaling an estimated $30-plus million. The company used those six-and-a-half total minutes to air spots featuring mermaids, a whispering lady, some Game Of Thrones cross-promotion, and a (hopefully final?) “Dilly Dilly” bit. 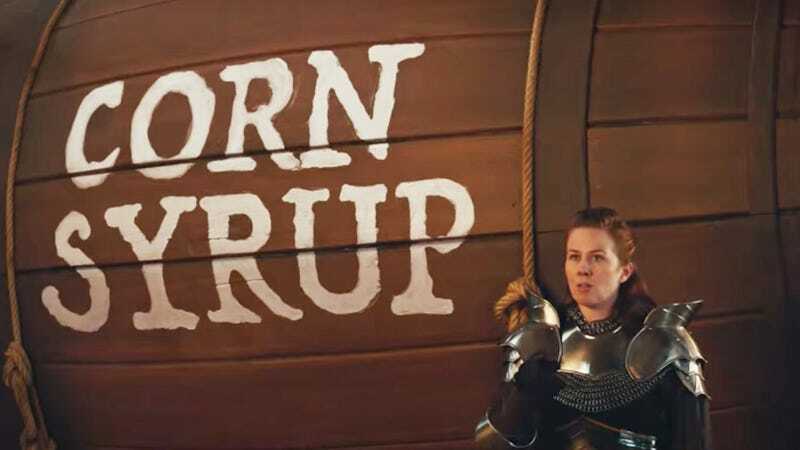 But the most talked-about commercials, especially in the beer Twitter sphere, were the Bud Light ads that directly attack Coors and Miller for using corn syrup in their brewing process. Why did Bud Light use corn syrup as the weapon for its knock against competitors? (The move certainly didn’t do Bud Light any favors with corn farmers.) I read it as part of Bud Light’s attempt to position itself as an option for diet-conscious drinkers. Just a few weeks ago, the brand became the first major American beer to list nutrition facts and ingredients on its packaging. And to some drinkers, corn syrup doesn’t sound like an attractive or healthful beer ingredient. Water, yeast, barley, and hops—that’s what beer is made of, right? Sometimes, but that’s an oversimplification. Breweries both big and small have for decades been making beers with ingredients from wheat to oats to fruit to milk sugar to spices to rice. You may not enjoy or purchase Bud Light, and that’s fine, but here’s why the corn syrup accusations shouldn’t be the determining factor in that decision. During the brewing process, yeast eat sugars and turn them into alcohol. Corn—in flaked or syrup form—is just one ingredient brewers can use to add fermentable sugars to their beer. Sugars could also come from barley or rice or corn or even sugar beets. When brewing American light lagers like Bud Light or Coors Light or Miller Lite, brewers often substitute a fermentable sugar other than malted barley for a portion of the grain bill, because ingredients like corn or rice lead to a lighter, less “full” beer texture. Using corn helps keep the beer’s body light and refreshing, these beers’ entire goal. Bud Light doesn’t use corn to achieve this, but instead uses rice. (And I’d bet Anheuser-Busch brewers aren’t dumping heirloom rice into their brewing vessels; it’s most likely a rice-water slurry that a competing brewery could derisively refer to as “rice syrup.”) MillerCoors’ chief communications officer Pete Marino tweeted to that effect, saying that some of its products do use corn to aid fermentation, while Bud Light uses rice. He then fired a shot, alleging some of Anheuser-Busch’s products are made with high-fructose corn syrup. But it’s not just light lagers that use corn sugars. Even craft beer’s darling IPAs typically include dextrose, a sugar derived from corn; longtime beer writer Jeff Alworth says it’s likely the most common sugar used to brew modern American IPAs. In fact, no less than Russian River’s Pliny The Elder, often considered the best double IPA in the world, includes corn. Russian River cofounder Vinny Cilurzo tells Alworth: “We’re using a lot of sugars in the fermentables [in that beer], dextrose sugar, so it’s drying the beer out and giving the beer a nice light, dry body. Super crisp, but really dry yet really bitter.” And Belgian brewers, some of the most traditional in the world, have used corn to supply up to 20 percent of the fermentable sugars in their beers for decades, if not hundreds of years. (Beloved brewery Rodenbach included.) If corn sugars are fine for the “best” double IPA and Belgian grand crus in the world, why wouldn’t they be fine for the light lager you’re going to mindlessly drink while shoveling onion dip-slathered potato chips into your face? Questions of where the sugars in your light lager come from are, in my opinion, irrelevant for the average drinker. Unless you are allergic to corn, there’s no reason to demonize it as an ingredient in your beer. Yes, all-malt beers are richer and more flavorful than their rice- or corn-adjuncted counterparts, but that’s not what light beers are about. They’re about refreshment, a light texture, high carbonation, and fewer calories. Arguing that a light lager is inferior to an all-malt English brown ale is comparing apples to oranges. Demonizing corn sugar just because it somehow sounds bad is reminiscent of the attacks on MSG or xantham gum. If corn sugars are good enough for use in some of the best beers in the world, they should be equally acceptable in your gas-station six-pack.